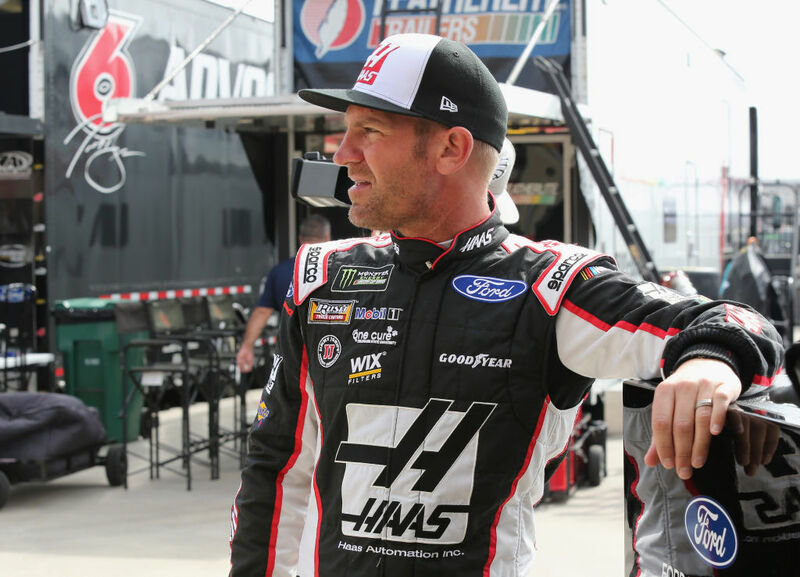 Clint Bowyer jokes about his love-hate relationship with Martinsville (Va.) Speedway, where the Monster Energy NASCAR Cup Series holds its sixth race of the 2018 season Sunday. Sometimes he really likes the flat, half-mile, paperclip-shaped track in Southern Virginia and, at other times, not so much. Right now, Bowyer is in love with Martinsville. That’s probably because he battled for victory last October before finishing third. In last year’s spring race, Bowyer drove the No. 14 Stewart-Haas Racing (SHR) Ford to a seventh-place finish. But, he hasn’t always been a fan of the place. Bowyer has come close at Martinsville, but he’s yet to add a clock to his trophy case. He owns five top-five finishes and 14 top-10s and has led 356 laps on Martinsville’s concrete surface. He led 154 laps during the fall 2012 race amid a string of five consecutive top-10s there. Sunday at Auto Club Speedway in Fontana, California, Bowyer ran in the top-10 most of the race until a tire problem in the final laps left him with an 11th-place finish. Bowyer is ninth in points heading to the Cup Series’ first short-track race of the season. SHR arrives at Martinsville on a historic roll with all four drivers in the top-11 in the standings. Martinsville is a historically good track for the Kannapolis, North Carolina-based organization. SHR owns three victories – Ryan Newman in April 2012, Tony Stewart in October 2011 and Kurt Busch in March 2014 – eight top-five finishes and 20 top-10s in 54 starts at Martinsville, and SHR cars have led 504 laps there. While he’s feeling good heading into this weekend, Bowyer knows there’s always the fickle nature of Martinsville that could turn him back toward not liking the place. But, he said that’s part of the track’s allure to fans and television viewers and a welcome relief from the high-speed, aerodynamic-dependent tracks the series has visited thus far in 2018. Bowyer’s No. 14 Ford will sport a bit of a different look at Martinsville as Haas Automation, the largest CNC (computer numerically controlled) machine-tool builder in North America, will highlight Demo Day 2018 that will be held May 9 at local Haas Factory Outlets (HFOs) nationwide. The annual event provides HFOs an opportunity to feature the latest CNC machines, innovations, and technology from Haas Automation. Showcased will be machine-cutting demonstrations and educational seminars to explain how the latest Haas machines and options can help make current Haas users, potential customers, and anyone in the manufacturing industry learn how the latest Haas machines can help a business be more productive, efficient, and profitable. Introduced in 1988 in Chicago, the Haas VF-1 established an industry milestone by being the very first American-built vertical machining center to sell for less than $50,000, an unheard-of price at that time. With a published price of $49,900 – another industry first – the Haas VF-1 quickly became the industry benchmark for affordable CNC technology. Martinsville seems to be the most difficult track for drivers to figure out. Why is that? Is there anything you would change about Martinsville?